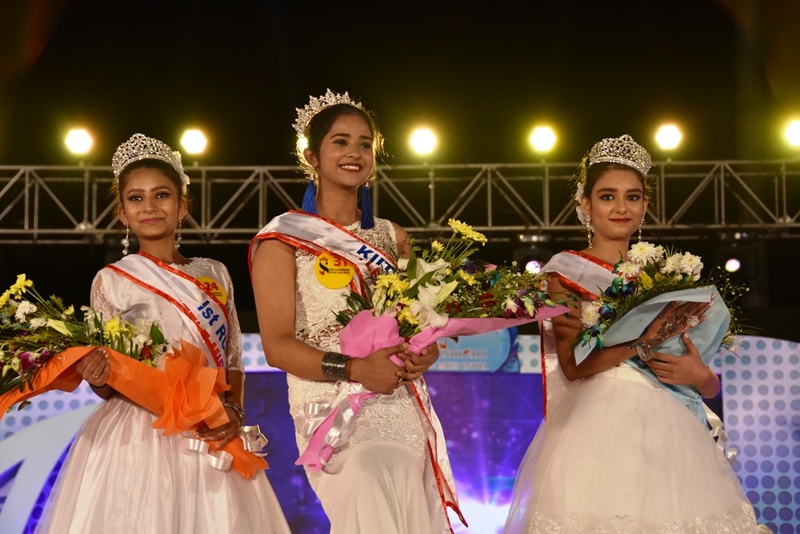 Bhubaneswar: Style, compassion, talent, intelligence and elegance were at its best as teenage models took the ramp in the 18th Nanhipari-Little Miss India talent beauty pageant, which concluded at KiiT International School in Bhubaneswar on 30th December, 2018. Thirty young girls between 13-16 years shortlisted for semi final round from regional auditions from Guwahati, Luknow, Kolkata, Patna, Bhubaneswar, Mumbai, Delhi, Bangalore, Srinagar and Hyderabad faced several competitions during the two-day event. In the Grand Finale Shubhangi Dwivedi from Lucknow crowned KIIT Nanhipari- Little Miss India 2018. Yashika Singh of Delhi and Mira Singh of Amritsar were crowned first and 2nd runners up respectively. The top three also received a cash award of Rs. 3 lakh, Rs. 1 lakh and Rs. 50000 respectively, along with silver crown, trophy and certificates. Many other titles were decided in the final round such as, Miss Rapunzel – girl with most beautiful hair award was given to Amamdeep Kaur of Amritsar. Similarly Miss Photogenic- girl with best pose in photoshoot round to Tapti Thakur of Bhopal, Miss Selfie – Maximum likes on facebook page to Soumya Pradhan of Bhubaneswar, Miss Fashion girl with best costume in both rounds to Vanisa Dandapat of Bhubaneswar, Miss Whizkid girl with highest marks in quiz round to Goutami madan Deshmukh of Mumbai, Miss Cinderella girl having best personality to Mira Singh., Miss Urvasi girl with Best Talent to Chandrima Sarkar of Kolkata, Miss Catwalk girl with best ramp walk to Shubhangi Dwivedi, Miss Monalisa most beautiful girl with most beautiful smile to Bhoomika R of Bengaluru and Miss Active – most active girl to Ananya Sharma of Jamsedpur got a cash prize each. Dr. Achyuta Samanta, Chief Patron of KIIT Nanhipari; Malay Mohapatra, Patron were awarded the winners. The Prize Money for the winner got Rs. 21lakh – Rs. 3 lakh cash prize and 100% academic fee waiver subject to a maximum of Rs. 18 lakh for studying in any discipline in KIIT University, along with that a weeklong visit & stay to South Korea with one of her parents sponsored by Hongbeopsa Management. The 1st Runners Up won Rs. 10.0 lakh – R.1.00 Lakh cash prize and 50% academic fee waiver subject to maximum of Rs. 9.0 lakh for studying any discipline in KIIT University. Similarly, the 2nd Runners Up won Rs. 9.5 lakh – Rs.50000 Cash Prize and 50% academic fee waiver subject to maximum of Rs. 9.0 lakh for studying any discipline in KIIT University. Besides the winner and runners up, pageants also awarded for special categories including Miss Rapunzel, Miss Monalisa, Miss Selfie, Miss Fashion, Miss Catwalk, Miss Whizkid, Miss Photogenic, Miss Cinderella, Miss Urvashi and Miss Active. “Nanhipari” is a talent show for teenage girls between the age group of 13-16 years. It had a modest start in 2001 in a remote and small tribal town of Kendujhar District of Odisha. In a short time-span of just 18 years, it has become a national event of repute, touted as the ‘Little Miss India’ competition, the only one of its kind.